The game features a franchise mode with a SportsCenter feature hosted by Chris Berman. He outlines the games of the current week with his co-host Trey Wingo who talks about the latest injuries and free agent deals and trades during the season. Mel Kiper Jr. hosts the draft portion of the segment while Suzy Kolber reports from the sidelines. There is also weekly preparation for the coming week which allows the player to make decisions on training and preparation. The player can also create his or her own team deciding the team logos (over 10 are available), team name, the team's city, the team's stadium look and build, jerseys and how good the team is. It also has a feature called first-person football, which gives the player the experience on the field looking from the eyes of the players. There is also the traditional create-a-player mode. One of the features in the game is a celebrity game involving Jamie Kennedy, Steve-O, David Arquette, Funkmaster Flex, or Carmen Electra which is initiated by a phone call from one of the aforementioned "celebrities" in the player's custom crib. The player plays against a celebrity with his or her own custom team of Pro Bowlers. The teams the celebrities use are The Buartville Funkmasters, Cincinnati Electra Shock, LA Dreamteam, Los Angeles Locos, and the Upper Darby Cheesesteaks. During the game, the celebrities appear in a small box and use trash-talk. If the player wins the game, they receive the team's stadium as a playable venue. ESPN NFL 2K5 features the voices of Terry McGovern as play-by-play announcer Dan Stevens, Jay Styne as color commentator Peter O'Keefe, sideline reporter Suzy Kolber, studio host Chris Berman, Trey Wingo, and Mel Kiper Jr., with Berman appearing at the start of a player's own SportsCenter broadcast and during the loading screen for the player's own ESPN NFL Countdown pregame show, and Kolber appearing in the Player of the Game segment of the postgame show. By July 2006, the PlayStation 2 version of ESPN NFL 2K5 had sold 1.7 million copies and earned $33 million in the United States. Next Generation ranked it as the 23rd highest-selling game launched for the PlayStation 2, Xbox or GameCube between January 2000 and July 2006 in that country. Combined sales of ESPN NFL console games released in the 2000s reached 3 million units in the United States by July 2006. ESPN NFL 2K5 was critically acclaimed across the media spectrum. IGN was quoted as saying "ESPN NFL 2K5 will own your soul." GamePro was quoted as saying that it's "The most entertaining show in video game football." Game Informer went on record to say that ESPN NFL 2K5 is "The one football game you must have." In 2014, Owen Good of Polygon wrote that "few other games — in any genre — have remained a constant part of modern conversation despite not publishing in a decade, and with no sign ever of returning". He called NFL 2K5 "sports video gaming's King Arthur, eternally populist, noble and heroic, champion of an age long ago enough to make its triumphs soar and its shortcomings recede to nothingness". Good stated that Madden NFL's developers "for 10 years have been haunted by NFL 2K5 — in forums, in comments, in social media — that nothing they do could be as good as something that by now really isn't a video game, but a mythological ideal that grows more romantic with every year". In August 2016, ESPN NFL 2K5 placed 41st on Time's The 50 Best Video Games of All Time list. In 2005, the game won the Academy of Interactive Arts & Sciences Interactive Achievement Award for Sports Simulation Game of the Year. ^ Bissell, Tom (2012-01-17). "Kickoff: Madden NFL and the Future of Video Game Sports". Grantland. Retrieved January 21, 2012. ^ Cobbs, Chris (2004-12-15). "Electronic Arts Scores Nfl Exclusive". Orlando Sentinel. Retrieved December 10, 2012. ^ Pigna, Kris (December 23, 2010). "Judge Allows Madden "Price Fixing" Lawsuit to Proceed". 1UP.com. Archived from the original on July 26, 2012. Retrieved February 26, 2012. ^ Albanesius, Chloe (July 23, 2012). "EA Settles Football Game Class-Action Suit for $27 Million". PC Magazine. Retrieved March 6, 2016. ^ Good, Owen (April 16, 2013). "The Madden Class-Action Settlement Triples Its Payout to Gamers". Kotaku. Retrieved March 6, 2015. 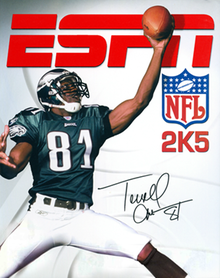 ^ "ESPN NFL 2K5 for PlayStation 2 - GameRankings". www.gamerankings.com. ^ "ESPN NFL 2K5 for Xbox - GameRankings". www.gamerankings.com. ^ Good, Owen S. (2014-07-20). "NFL 2K5 — sports gaming's King Arthur — launched 10 years ago today". Polygon. Retrieved 25 January 2015. ^ "2005 8th Annual Interactive Achievement Awards". Academy of Interactive Arts & Sciences. Retrieved 2011-07-13.